Extreme action in poorly lit interiors is always a challenge in photography, and unfortunately, most dojos (martial arts studios) I’ve had the pleasure to document photographically were caves when it came to ambient light. If you’ve read many of my blogs you know that I’m a really, really, really firm advocate of natural light whenever possible—especially in portraiture. But, when it comes to interiors, where there’s any action, if you don’t have the light, as a professional, you must create the light to get the job done. As soon as I walked into this room with its dark wood paneling I knew I’d have to use flash to avoid the black hole look and to stop some action. Many years of wedding photography has taught me that flash as the only source of light for interiors is horrible—it’s too harsh and your background goes dark so you lose depth. So, to show depth in the scene and stop action we “drag the shutter” during the flash exposure. This simply means we use a longer shutter speed than is usually used for flash photography—we usually use the fastest shutter speed that will sync with the flash. With a longer shutter speed we are literally dragging in more of the room’s ambient light. 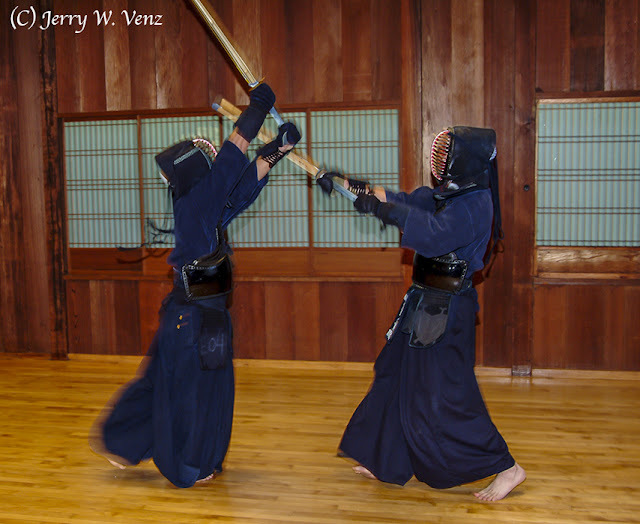 Here’s the technique I used on the Japanese Martial Art of Kendo…. 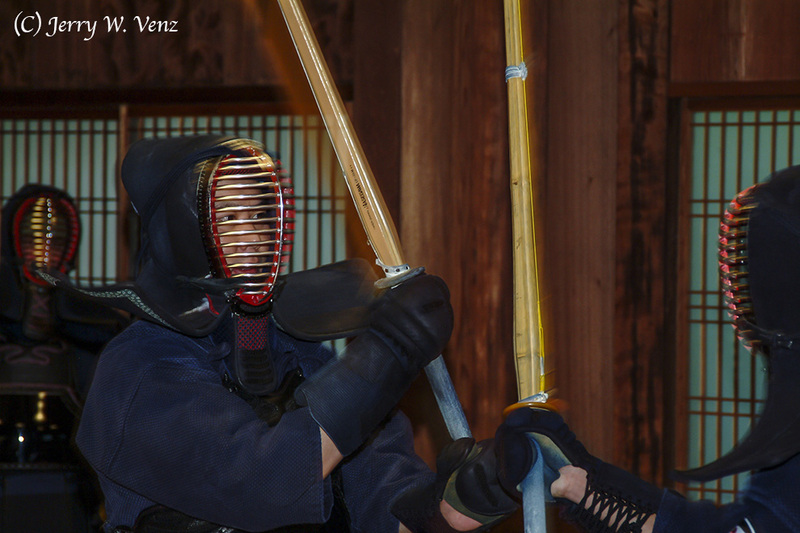 Here’s what’s happening: The instant you snap the shutter the flash goes off stopping the action and creating all the highlights in the scene—the brightest images of the bamboo swords and those cool highlights on their chrome face guards for example. But, because we are forcing the shutter to stay open longer than the flash duration we get the secondary images of any fast moving elements in the scene. In addition that longer shutter is also providing more exposure for the rest of the room—so, the background is not pitch black. Meter the room’s light level to establish your base exposure—I use an incident, hand held, light meter. I use the ISO to get me to a shutter speed I like. In this case I wanted 1/30 sec. and at ISO 400 my f-stop was f4.8, giving me adequate depth-of-field. With my camera in Manual Mode to use my settings I put the flash in Auto set to f5.6—to allow for flash fall-off because I’m bouncing the flash off the ceiling with a flash defuser (the Gary Fong unit). While leaving the camera’s f-stop at f4.8 I’ll raise the flash to f8.0 for more flash effect or f4.0 for less flash effect. and/or I’ll tilt my flash more or less (it’s usually tilted at 45°) flash effect. Shutter speed selection is a matter of taste. 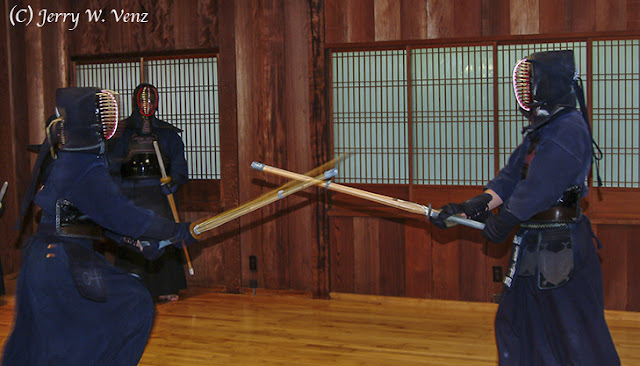 For really fast action like these martial artists I like 1/30th sec. because while I get nice action blur of their swords, arms and legs, their heads are still sharp. See how sharp this guys eyes are…. If you go to 1/15th sec., or shower then the action images start getting too abstract for my taste. Wedding photographers have been using this technique for many decades and it works great for the reception events like the bouquet toss, garter toss, (just don’t drag it too long for these events) and the rock-n-roll dance action for something different….